It doesn’t much matter whether you’re a blocker or a jammer (or a “blammer!”). You know that you need strength, power, and agility to be successful out there on the track. You probably know some bodyweight-only strength moves you can do (for example, maybe you’ve tried the BasicsBuilder free eight-minute workout series, or the Basic Training workout video?). 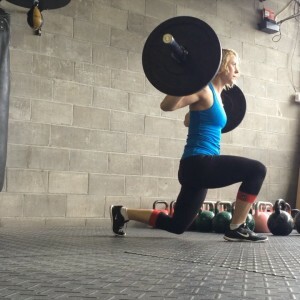 And you might know that you can do some squat jumps “and stuff like that” to build power through plyometric training. Maybe you’ve guessed at how to improve your agility. But maybe, just maybe, you’re looking for someone to tell you… Exactly. What. To. Do. StrideBooster training is here to do exactly that. I want you to level up and be even more of a superhero out there on the track; StrideBooster will give you that edge. StrideBooster is derby-specific training. It combines strength training with plyometrics and agility workouts, in a carefully designed progression that will allow you to build from one week to the next, while also practicing on skates — but without overtraining. StrideBooster will build your explosive power, quickness and agility for blocking or jamming. It will provide some endurance benefit as well, but realistically you can’t adequately train all elements concurrently. Therefore, this program has prioritized the elements I believe are the true differentiators – the elements that can set the champions in roller derby apart. Are you hooked yet? Keep reading the Q&A below to see if this program is right for you. A. StrideBooster – Advanced, derby-specific training focussed on Power, Agility, and Quickness. It’s a six-week fitness program, with 3-4 workouts per week of approximately 45 minutes to 1 hour each. Q. How is this different from StrideBuilder? A. StrideBuilder is an introductory-level program using bodyweight-only exercises to help newer skaters (or those returning from injury) to build up the necessary lower body strength and body mechanics for skating. It’s especially effective for skaters trying to improve at their 27-in-5 laps test. StrideBooster is a next-level program designed for athletes who already have that basic strength and power. 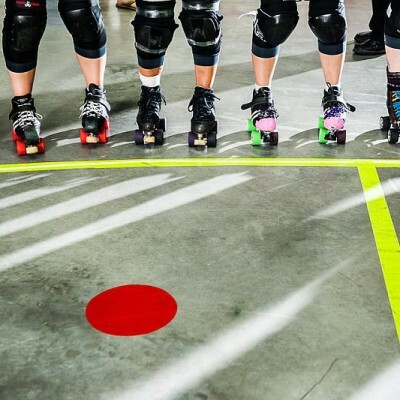 It uses free weights, in conjunction with plyo and agility training techniques, to build an elite-level athlete to excel in roller derby. Endurance Test: 5:50 or less. Hitting the mark on some but not others? The two most important for this program are the Agility and Vertical Leap tests, so if you’re cruising on those results and a little behind on one or two others, you’ll still be good to go for StrideBooster. Q. How does this fit in with my already-crazy skating/training schedule? A. You’ll get details on which workouts you can double up with your on-skate days, and which ones you shouldn’t. If you’ve got practice 3-4 days a week, then expect to train more than once a day, some days. You are required to get at least one rest day per week. I recommend setting aside any other training regimens you are currently following (e.g. weights program, running program, etc) while you are working through StrideBooster. The exception would be to continue with 1-2 yoga sessions/week, if that’s your thing. Q. How is the content delivered? A. Online, through a members-only access area. You will need internet access via desktop, smart-phone, or tablet to access workouts and watch instructional videos. I’ll also email you every week with some reminders, tips, and encouragement! A. Normally I try to keep programs as gear-free as possible to remove any barriers to entry. BUT, for this one, you’ll benefit from access to some dumbbells, kettlebells, or a full barbell set-up (at home or gym). Can’t access any weights? I can provide modifications, but you won’t get the maximum benefit from the program. You’ll also need access to a flight of stairs, and a sturdy 20-24″ bench or box for box-jump exercises. Both of these can usually be had outdoors at local parks or rec centres. An interval timer or stopwatch is essential, and you’ll be happier with a yoga mat. Q. What if I can’t finish in 6 weeks or I get sick or injured? A. No prob. Life happens and so does derby insanity (Rollercon, anyone?). The program is six weeks long, but most real life humans will take 7 or 8 to complete. If you get injured we can talk about deferring you til you’re better :) Plus, you’ll automatically get access to the entire program, PLUS all of the premium content here for three full months. Q. What if it’s absolutely not for me and I hate it? A. Cancel by the 3rd week and you’ll get a full refund, no questions, no hassles. Q. Right, I’m sold. I want to level up my game and be a powerhouse this season! How do I get in on this? Take my money! Etc. etc. etc.